From the left: Rajiv Puri, senior vice-president, Projects & Developments, Minor Hotel Group, Nikolaus Priesnitz, general manager, AVANI Bangkok Riverside; William E. Heinecke – chairman & CEO Minor International; Dillip Rajakarier, COO Minor International & CEO Minor Hotel Group; Pleumjit Chaiya, vice-president, Project Development, Thailand, Minor Hotel Group; and Micah Tamthai, vice president, Real Estate, Minor Hotel Group. 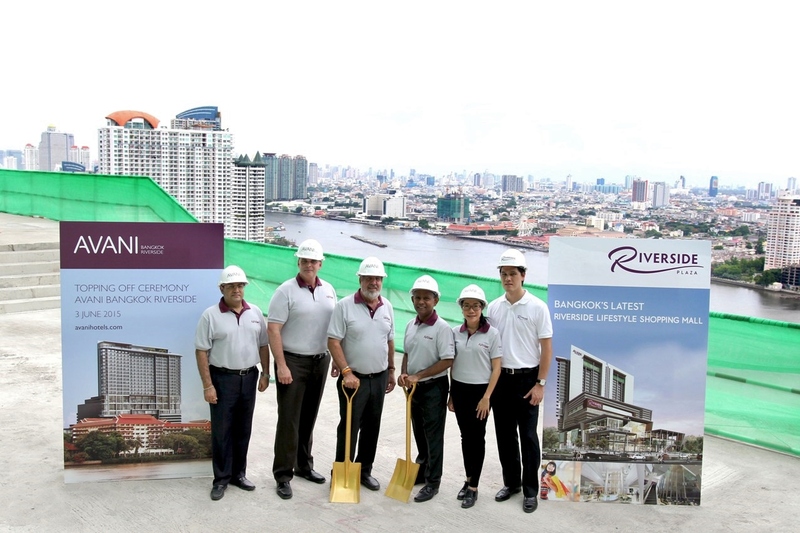 AVANI BANGKOK RIVERSIDE celebrated its official “Topping Off” at a special gathering to mark the completion of the hotel on the roof of the 26-storey hotel against an impressive back drop of Bangkok’s skyline and the Chao Phraya River. The ceremony was attended by senior executives from Minor International, MINT), including William E. Heinecke, chairman, and CEO Dillip Rajakarier, MINT COO and CEO of Minor Hotel Group, along with Nikolaus Priesnitz, general manager of the new hotel. 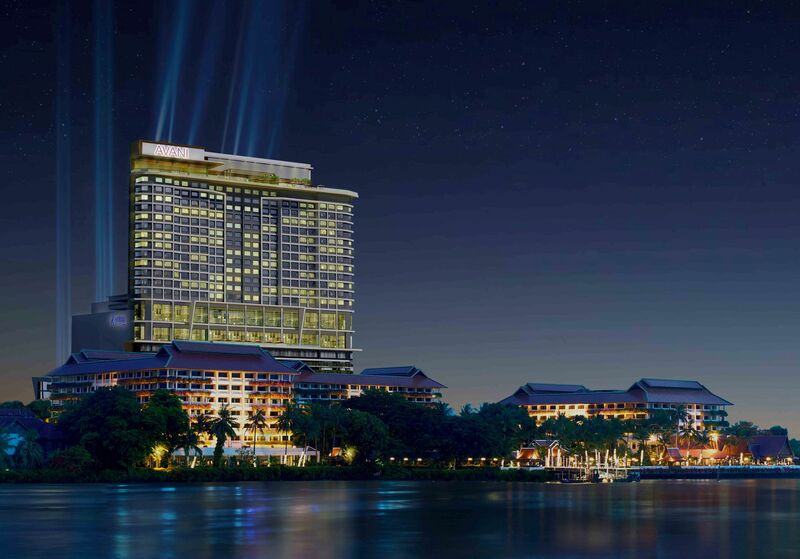 When it opens later this year, AVANI Bangkok Riverside will be the first new build hotel in AVANI’s upscale portfolio, and the second hotel to fly the AVANI flag in Bangkok. Located just 15 minutes by luxury shuttle boat to the heart of Bangkok and opposite Asiatique, the city’s largest night market, the property has been purpose designed to show off all of the brand’s signature hallmarks and a trendy lifestyle destination, featuring contemporary accommodation, restaurants and bars, multipurpose meeting space and the Riverside Plaza. AVANI Bangkok Riverside will offer 249 guest rooms including 25 river view suites, all located on levels 12 and above to wow guests with fantastic river views. Guests will be able to swim and sunbathe with a stunning city skyline and river view, or work-out in the fully equipped gym. For a great day out exploring the capital, AVANI’s guided ‘local experiences’ will make it even easier to take in the iconic sights and get a true taste of local life. A choice of four restaurants and bars will showcase AVANI’s focus on good honest food. Skyline will offer an international gourmet breakfast, followed by a la carte and buffet dining throughout the day and evening. Up on the 26th floor at Attitude Roof Top Bar & Grill, guests will be able to tuck into contemporary favourites and grilled specialties, along with enjoying sundowners or poolside drinks, all while taking in spectacular river and city skyline views until late at night. The Long Bar will serve refreshments in the lobby and for round the clock drinks and snacks to eat in or grab on the go, The Pantry, a delightful designer deli, will be open 24 hours a day. AVANI guests, who are looking for additional lifestyle, dining and entertainment options, can stroll to the hotel’s Riverside Plaza where an incredible choice of 60 restaurants, bars and shops will please every taste. Catering for all kinds of social and corporate function, AVANI Bangkok Riverside will boast 4,500 square metres of multipurpose meeting and event space, offering one of the most versatile, state-of-the-art facilities in Bangkok, with a total capacity for 1,500 guests, 80 exhibition booths and 11 meeting rooms. Meeting venues on the tenth floor will impress business guests with exceptional city views, including Bangkok’s highest and one of the largest luxury Grand Ballroom’s on the river, which can be divided into four spaces with the unique option of opening up onto a show kitchen. AVANI is the vibrant upscale brand launched by Minor Hotel Group in 2011. Offering relaxed comfort and contemporary style in city and resort destinations to guests who value the details that matter, AVANI was launched in response to an increasingly influential group of discerning travellers who appreciate good design and excellent service, but also demand great value.